Create & Play camps are week long day camps that run Monday through Friday from 9am – 4pm. Each day our camp is broken up into two sessions: Create & Play. Our create sessions are targeted lessons for our campers basled on the camp they are attending. These are in the areas of video game design, graphics, web design and more. We do our best to provide a few lessons in the morning at around 30 minutes each. After each lesson we allow the campers to have hands on experience with what they’ve learned in a modified or more challenging way. There is a low counselor to student ratio so any questions are answered quickly. We’re able to expose the campers to a lot of different technology project & game genres, so by the end of the week they can create their own games or multimedia projects. If they weren’t having enough fun making their own games & media our afternoon play session allow campers to accomplish objective based game play with each other. We also do team based gameplay as a fun competition. We target games (such as Minecraft) that echo concepts that they learn in their create session but also give them ability to interact with other campers in game. With each camp we split our campers into 10 – 15 groups which allows for fun gaming competitions between counselor led teams. All camps provide all computer hardware and software that is needed for a successful camp. Each day of Create & Play camps offers two snack sessions and drinks provided daily. We also offer extended care hours from 8am – 9am & 4pm – 6pm that is available to all campers. 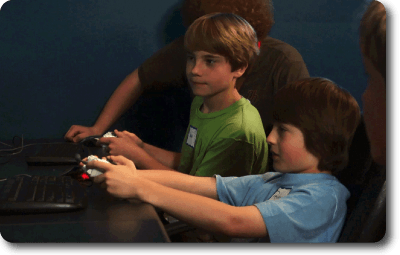 For more information about our parent company Video Game Palooza in general, please visit videogamepalooza.org. There you will find info about our other offerings, such as STEM Education classes, Charity Arcade and other services..